What Is The Best Laser Eye Surgery Treatment? If you are doing research in order to find the best laser eye surgery then you need to be aware that the best option for you will not necessarily be the best option for someone else. A lot will depend upon your particular eye condition as well as your budget and location. If money and travel is no option then it is not always the case that going to the most expensive clinic in London will give you the best outcomes – it will all depend on if they have carry out the type of surgery that brings the best success rate for your particular eye condition. If you are on a budget, then you should be looking for the best clinics and surgeons that you are prepared to travel to that offer laser eye treatments within your price range. It is often advisable to travel a little further than compromise on the clinic or treatment type. Therefore, the first thing to do is get an idea of the different types of treatments that may be suitable to treat your condition and then get quotes from different clinics which you will be able to do by filling in the form on this site. The clinics will be able to give you an idea of costs over the phone and normally give you a free consultation to clarify costs etc. LASIK (laser in situ keratomileusis). The most common form of laser eye surgery in the UK, LASIK has helped thousands of individuals with long and short-sighted difficulties over the years. It involves taking a flap of tissue from the cornea and reshaping the surface of it using an Excimer laser. 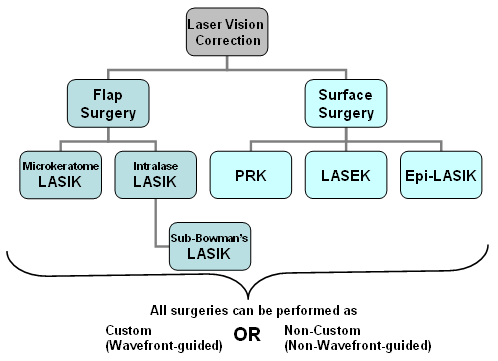 Wavefront-guided LASIK. An updated and more accurate form of LASIK, this involves using a three dimensional computer generated image of the cornea prior to the eye being reshaped with the Excimer. This makes it very much a customised treatment. PRK (photorefractive keratectomy). With PRK the flap of tissue on the cornea isn’t cut instead the epithelial covering for the eye is taken away completely then the laser reshapes. The epithelial heals itself in around four days and the patient is provided with a soft contact lense to protect the cornea in the meantime. LASEK (laser epithelial keratomileusis). This is similar to PRK except the epithelium is kept on the eye and used as a flap. This makes the healing process much quicker. Obviously when it comes to our sight we want the best treatment possible that we can afford and preferably from the top surgeon in the field. But how do we know how well qualified the individuals are that we’re going to be trusting with our eyes? One way to gain reassurance is to check his or her qualifications with the registering board. The Royal Society of Ophthalmologists for instance will award a Certificate of Competence in Laser Refractive Surgery to only those members who have performed at least 300 procedures within a period of two years. Similarly, it is also a good idea to check the clinic’s credentials of course, particularly with regard to after care as this can vary quite considerably. Some clinics, for instance, offer a check up once a year for life while others only provide this for three to four years following surgery. What are the potential risks of laser eye surgery? Like any operation there are risks involved in laser eye surgery. However, these are very minimal in comparison to traditional surgical operations. Success rates for the best laser eye surgery clinics, and indeed for laser eye surgery in general, are currently cited around 95 per cent. The risks are less for operations using laser to cut the cornea flap because of the reduced possibility of infection that could be picked up from surgical instruments during surgery. In some cases the operation may have to be performed again a decade or two down the line due to age-related deteriorated so there is no guarantee that the operation is a one-off (although this is the case for many individuals). Other risks include problems with driving at night, although this usually goes after several months. There could also be a ‘halo’ effect and which should similarly reduce as the weeks go on. Dry eyes can be annoying but not particularly painful, especially as the condition can be relieved with the use of eye drops. It’s possible the operation can actually exacerbate the patient’s long or short-sightedness but this easily be rectified via a second operation. Occasionally the eye can become unstable following an operation, resulting in a bulging. This is due to the cornea being too thin following surgery. How much will laser eye surgery cost? Prices for laser eye surgery vary depending on the type of surgery performed and the extent of the patient’s short or long sightedness or astigmatism. The location of the clinic will also have a bearing as will the experience of the actual surgeon performing the operation. Whilst you may see prices quoted from £600 per eye that will only be available to a minority of prescriptions and the PRK or LASEK treatment offered is inferior. You should should expect to pay £1,200 per eye or £1,600+ for those using the 3D Wavefront technology. In some of the more expensive clinics, can reach as much as £3000 an eye (although this is for particularly difficult cases with thinning corneas). You can see a more comprehensive guide to laser eye surgery costs here.